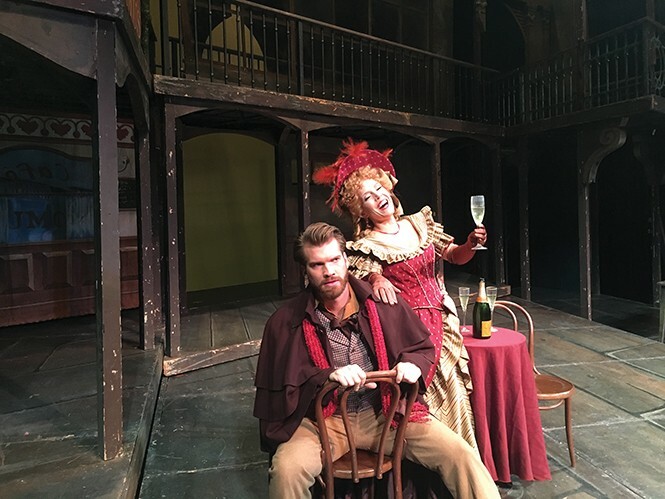 Utah Opera's La Bohème still speaks to audiences. Oct. 7, 9, 11 & 13, 7:30 p.m.
Forty years ago, when a fledgling would-be opera company in Salt Lake City made Puccini's La Bohème its first production, it might have felt like an obvious choice. In addition to being one of the most popular works in the operatic canon, it's also a story of struggling young artists doing what they do for pure love of creating, and with no guarantee of financial reward. Now that Utah Opera is an established institution, however, the production is bound to have a different meaning. For this rendition's director, Kathleen Clawson, that meaning is about resilience. "Great art survives," Clawson says. "Great art is spunky, and demands its place." Thinking about a work's meaning is naturally part of a director's job, as is the task of making that meaning accessible to an audience—especially in an art form where the story is being sung, and in a language unfamiliar to most of the attendees. Clawson—a faculty member at the University of New Mexico, returning to Utah Opera after overseeing the 2015 production of Tosca—believes that there are many ways in which her choices for a production can overcome those potential barriers. One of those key ways for Clawson involves an element that would seem relatively simple: the translated supertitles for the Italian lyrics. Where many productions make use of existing translations, Clawson says she creates all of her own titles "because I then use those words when I'm directing, so that we're all on the same page. You might think that phrase means [only]what it means to you, but if I say 'this is what is happening at this moment,' everybody on stage has the same picture." As an example of how such translations can matter, Clawson describes a production of Tosca she once attended, and a scene involving the title character seeing that her lover, an artist, is painting a portrait of a woman who does not look like her. Tosca's eyes are dark; the eyes of the woman in the portrait are blue. "As she leaves, [Tosca] says, 'Make sure to change her eye color,'" Clawson says. "If you translate it word-for-word from Italian, it says, 'Give her black eyes.' But to us, that phrase means something entirely different. 'Make her eyes dark' is what it means. I saw titles that said 'Give her black eyes," and I went, wait, no. "As a performer, I can remember being on stage, not having seen the titles, because we're on stage when they're up there, and the audience was laughing. I was thinking, 'What we're saying, what we're doing, is not funny at all.' That can be really disturbing." Clawson also explains that she leans on the power of an operatic score to help establish a mood that doesn't require literal translation of text. "Especially for Puccini, that's right about the same time music is being used almost like film scores, telling you what's going on," she says. "Just like in a horror film when those strings get going, you know something bad is going to happen. The orchestration in an opera does that, and Puccini was a master." As a director, then, Clawson sees it as one of her responsibilities to make sure the action she's designing for the performers matches the emotional tenor of the music. "Sometimes I'll watch a production where the music is vigorous and lively, and everybody is just standing there," she says. "And I keep thinking, 'The music is telling you to move. Why aren't you moving? How can you stand still when the music is doing that?' That's my job, just to pay attention." This Utah Opera production marks the third time Clawson has directed La Bohème, and part of that paying attention for her means applying what she's learned from her own additional life experience—including having directed a production of the musical Rent, a modern-day interpretation based on the same source material—or from a suggestion by one of her cast members that presents a different way of looking at a character. Her interpretation this time around, however, doesn't necessarily fold in the present American political moment, even for a story about the struggles of impoverished young people. "Although I certainly am a political person, and can see the politics in things," Clawson says, "I don't think that's their impetus for the life [these characters are] choosing to live. ... I don't think [Puccini] and his librettists were trying to make a political statement. These people are happy, and these people aren't. Choose happiness. Choose joy. Chose love. "What La Bohème has to say is something that speaks to everyone, at all stages of life. And I believe it will endure way past what's going on with us politically."